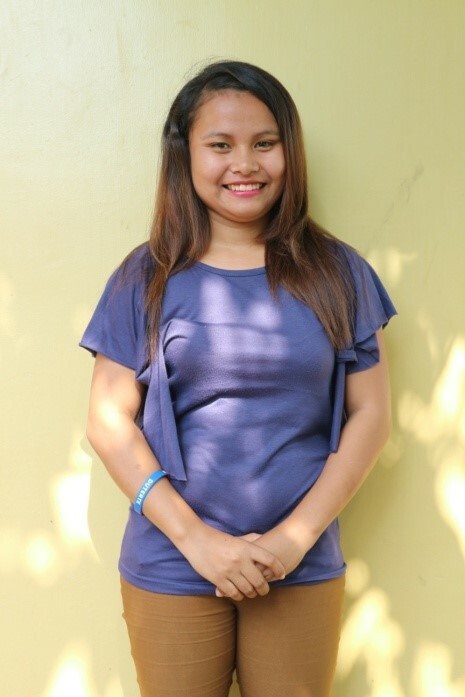 Nineteen-year-old Maylyn Mabasag is the Project Director of the Ata Hostel for students on a mountain slope in the outskirts of Davao City, Philippines. Many girls her age are married now with children but Maylyn counts herself fortunate to have been sponsored by ICCM when she was eleven years old. Her fondest dream was to go to college. When she graduates from university, she will be the first one in her family to have acquired a college degree. Not only is she pursuing a degree in elementary education, but Maylyn is getting her internship way ahead of anyone in her class. As Ata Hostel Project Director she recently learned how to make annual plans and budgets for 41 children under her care; develop activities that reflect minimum standards of holistic child development; tutor children of various ages in social studies. Maylyn thanks God for the tough times, “I am so thankful to God who has not neglected me. I thank Him for the hardships I’ve gone through because these hardships challenged me to keep on in completing my education… Hardships cannot keep you from reaching your dreams.” Resolutely determined, Maylyn is proving that Ata children too can dream and walk with God as he turns their dreams into their longed-for- reality.